Our favourite hostel on our trip to Japan! The environment here was amazing if you are looking for a clean, quaint, and social atmosphere. The bunks were very spacious with a small nightstand to easily organize and lockup toiletries and valuables, and to charge electronic devices. The common room was awesome and the large dining table facilitated making friends from all around the world. Great location close to the Peace Memorial Park& Museum, as well as a short walk to the entertainment area! This place is amazing. The staff were awesome and kind. I loved the rooms and the living room. The showers are great and everything works perfectly. 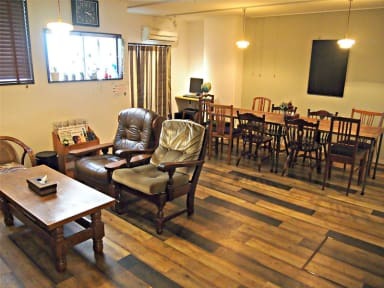 One of the best hostels I stayed at during my time in Japan. Although, it was only for a night, it checked all the boxes. About 10 mins walk from Hiroshima Peace Memorial Park and the A-bomb dome. Great staff, big kitchen and living room. Would definitely recommend. Awesome hostel, with wonderful staff who are SO kawaii! The staff were so helpful with recommendations for activities and places to eat, transport, etc. The rooms were really nice and spacious and it’s in an excellent location. Thank you for a lovely stay. Solid Hostel. Ideally located for the usual sight seeing things in Hiroshima, Peace Park, A Bomb Memorial, but a little removed from other things. If you just wanna do the touristy stuff 10/10, but if your looking at hitting up the downtown area maybe look somewhere else. Good place with all basics covered. Spacious almost apartment like bunks. Highly Recommended. 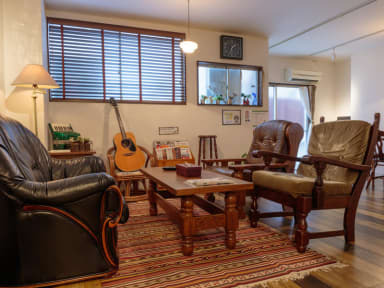 This place was fine, but I did not realize it would be a traditional style, with a futon on tatami mats. Had I known that from reading the room descriptions I would not have booked it because my back hurt terribly from sleeping on it. Otherwise everything was ok. Worst hostel of the trip! The walls were paper thin and you could hear anyone in the building. No social atmosphere. The mattresses were absolutely terrible. They are literally 1 inch thick and my back is killing me after sleeping on them. The doors don’t automatically lock afterwards so they were unlocked for the entire time since people forgot to lock them. The only redeeming factor was how close it was to the park and JR bus stop, but I wouldn’t recommend this hostel to anyone!